1. Kathie stated that Mike Porter asked for a meeting, Kathie said, "I would like to sit and ask point blank questions." 2. Kathie didn't want to take advantage of the situation of the man who murdered and sexually assaulted her grandchild? Please! 3. Instead of asking for information about the death of her grandchild, she's interested in her civil suits. 4. Kathie says "You give me information for civil suits and to put people in jail, and I'll talk deals" basically. 5. The first person she mentions is Gayla. Why? 6. This email is the first time I've heard any mention of Miste lying about Kelsey spraining her ankle at the zoo. I believe that Mike Porter threw that out there for the Briggs to feed on so they would see him as valuable and work a deal for him...it obviously worked! 7. Why doesn't she feel the need to hold herself accountable for quitting on Kelsey and not showing up for supervised visitation and not showing up for the September hearing? What about when she let Kelsey crawl around in pain for four days when Kelsey couldn't walk at Kathie's home and Kathie didn't take her to a doctor? 8. "You are young, you got caught up with a family that snowed you big time." What the hell?? Why would you say that to a man who the DA says murdered your grandchild? What does Raye Dawn's family have to do with them trusting a murderer? 9. He refused a lie detector test, what makes her think he'll tell her the truth about anything? 10. Why ask Mike Porter for witnesses to anything that Raye Dawn did? We saw how well that turned out in court didn't we? 12. She has compassion for a murderer because he doesn't have parents? Give me a break! 13. She doesn't want to make the man who murdered her grandchild feel worse? Why not? 14. "My feelings for Raye and her family..." she admits her hatred, which is obvious. 15. Where did she come up with the idea that Raye Dawn's family hated her family? Lance beat Raye Dawn several times and caused her to miscarry their first child. Lance broke into Raye Dawn's home on numerous occasions and trashed the place. Lance called and threatened to break into the homes of the DHS supervisor and Judge Key and kill them and their families. Raye Dawn was advised to then get a protective order against Lance. The day of Kelsey's funeral the BRIGGS insisted on their own funeral and left the Smiths to take care of the balance. The BRIGGS did not get a bomb threat during their funeral, but the Smiths got one before theirs and the message mysteriously disappeared. Raye Dawn may have been rightfully scared of the Briggs, but the hatred I've seen has been from the Briggs and not the Smiths. 16. She never reached out to Raye Dawn or her family and tried to work with them. 17. Here it is! Kathie agrees with Judge Key even though she has adamantly denied that Kelsey was in a custody battle. She said, "It is hard to think a small child as precious as Kelsey died because so many loved her and fought over her." This is so true! So why did you admit it to the man who murdered her and you deny it to the public because a man you hate and have worked hard to destroy his life and the lives of his wife and children for a reason that I really don't understand pointed out the obvious? Why didn't you work as hard at destroying the man who took the life of this precious child? 18. Again, worry about Mike's comfort level. But what about Raye Dawn, the mother of your grandchild? What about a man who was doing his job? What about a doctor who was doing her job? What about all those people you've made your life's mission to destroy? Why not destroy the man who murdered Kelsey instead of treating him like an old friend? 19. In Mike's response (at the top) you'll see that we're missing some of it. 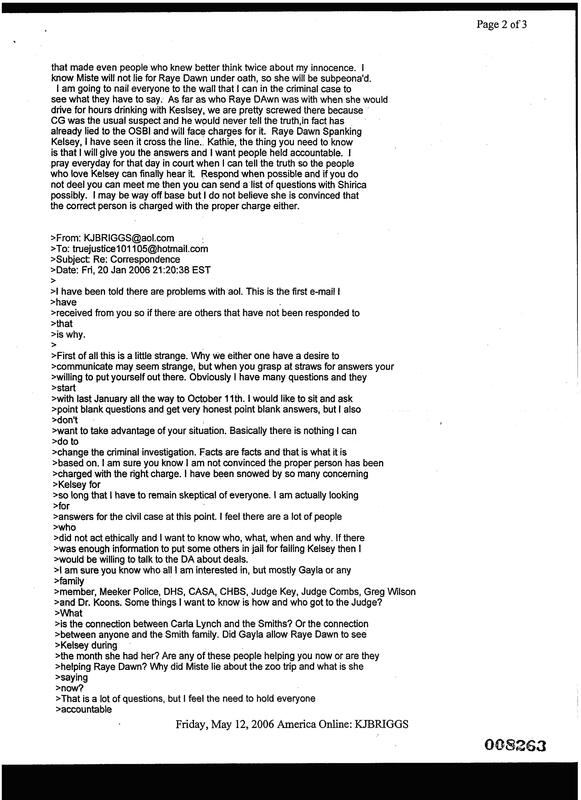 This is just one of the missing pieces to these emails and I don't know why they weren't turned over as well. 20. Mike begins his response with offering whatever Kathie wants to hear. 21. He said here that he saw Raye Dawn's spanking "cross the line." That is nowhere near the picture he painted in court. Did his story exaggerate to fulfill his plea? Did his story exaggerate to please Kathie and Lance? 22. He's desperate to make sure his charge is only enabling and Raye Dawn is charged with murder. This is so obviously a man trying to escape his charges. Were the Briggs just blinded by his offers of "money is no object" or were they so desperate to see "that hussy (Raye Dawn) in jail that they were willing to believe a murderer? Why would Kathie expect to hear the truth from the man who murdered and sexually assaulted her granddaughter? 1. Of course Mike felt there was evidence against Raye Dawn! He was doing everything possible to throw the heat off him! Duh! 2. Here is a novel idea. The man who murdered Kelsey wants justice for her...or is he just saying what the Briggs had been saying? It's called "saying what you want to hear." 3. Raye Dawn is the only one that I've yet to catch in a lie. I'm sure you can guess who holds the prize for most lies told...and it's not Mike. 4. Mike said that Raye Dawn was never pursued as a primary suspect. She still hasn't been pursued as a primary suspect. He said OSBI was just going through the motions. They had their man...a desperate, manipulative man. 5. How could "Richard" charge Raye Dawn as easily as Mike when Raye Dawn was not there? According to our contacts, Kelsey would have bled out in 3 to 4 minutes with the injury she had to her pancreas. Raye Dawn had been gone at the point that Kelsey turned blue for at least 36 minutes. When the EMT turned Kelsey over and she was blue Mike cried out. He had been standing in the yard holding her for several minutes and she turned blue when the EMT got there, which was approximately 11 minutes after Mike called 911. Raye Dawn had been gone at least 25 minutes before Mike's call to 911. 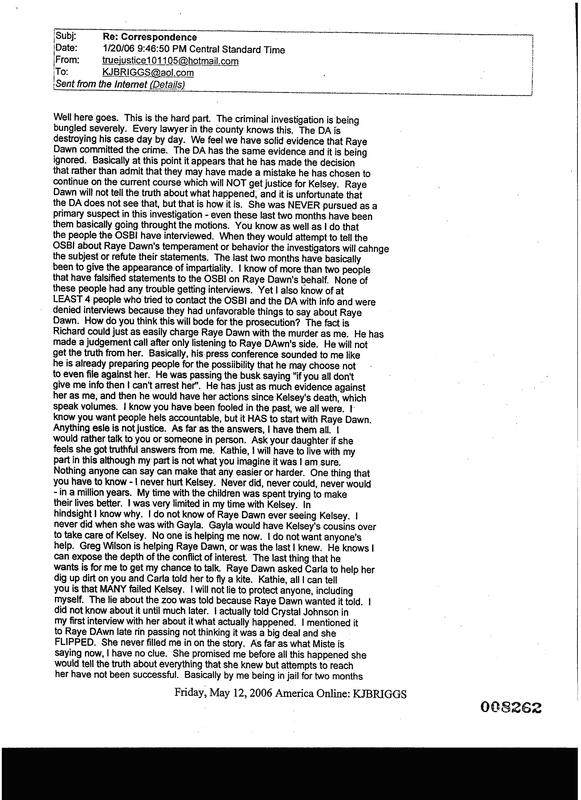 The DA had his man and that man has used IMPOSSIBLE SCENARIOS to try to convince people that Raye Dawn murdered Kelsey. Anyone with common sense knows that Mike's scenarios are just that...Mike's scenarios. 6. Of course Mike wanted it to start with Raye Dawn. He wanted to escape punishment for his crime. You'll notice there is a gap in the emails. Either the DA or the Briggs left some out. Maybe KP will post what we're missing. LOL! 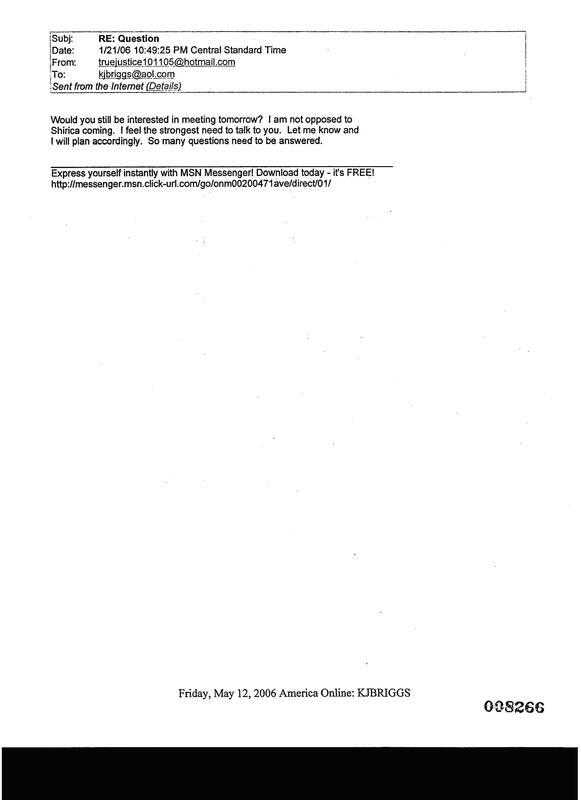 Shirica stated in December they would post the "real" emails on KP...we're still waiting. Who, exactly, answered the questions? 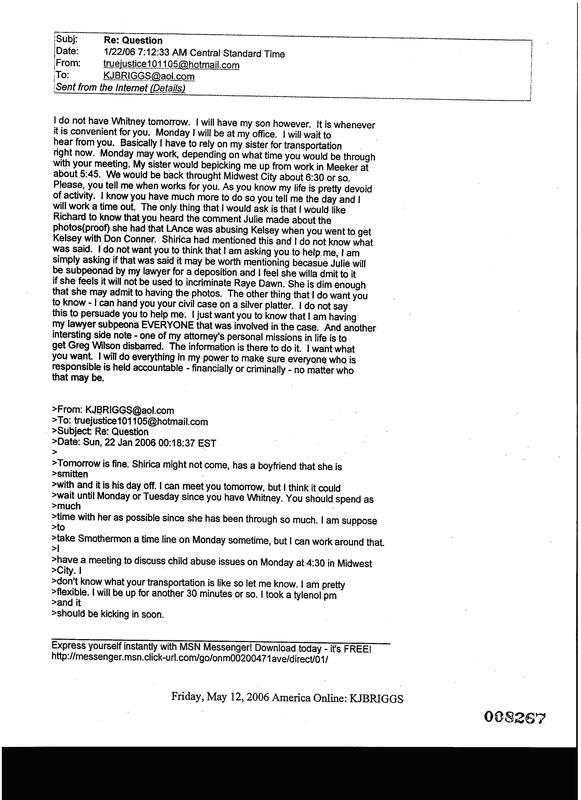 In Kathie's later emails she goes back and forth from admonishing him for ignoring her questions and telling him not to answer anything that will hurt his defense. Which was it? This is an excerpt from Raye Dawn's trial notes. Kathie Briggs is answering Huddleston's questions in this excerpt. Notice she said she was cordial. As you read further, you'll see just how cordial she was. After October 11th, 2005 in January of 2006 you started email conversations with Mr. Porter? He contacted me. You replied? Yes. Less than 90 days after the death of your granddaughter you met with the man who murdered her? He was only accused, he was not convicted. Did you shake his hand? NO. Were you nice to him? Cordial. Why would you meet with him? I had many questions about what happened to my grand daughter. You mean you wanted to build a case against my client? No. Weve discussed theres no one else involved what else could there have been to talk about besides Raye Dawn? I did not talk to him about the day Kelsey died. I asked about several specific incidents. You did not ask Mr. Porter about the day your granddaughter died? No I told him I could not change what happened that day and he would have his day in court. Have you talked with Smothermon about the charges at this point? Yes. The rectal bruises? Yes. And you still met with him? Yes, I needed to know some things about what happened to my grand daughter. You posted on Kelseys Purpose after Porter went to prison that you were only using him for information. Information on my client? I asked him for information about DHS and Judge Key. Were you contacted about the plea agreement reached with Michael Porter? Yes, we discussed it before he made the deal. Are you aware no one from the DAs office contacted my client about the deal? I dont know what the DAs office did. I'm starting from the bottom up - the way they write them. 1. Why share personal information about Shirica and her love life with the man who murdered her grandchild? 2. Why would a man who murdered a child have his children? Raye Dawn was only allowed SUPERVISED visitation with Blaine after he was born. Why the hell did Mike Porter have his children and why would Kathie be for him spending time with a child? Sick! 3. She is giving him step-by-step information of what she's doing and PERSONAL information. You don't do that when you're just "using and luring" someone as the Briggs claim. 4. How does Kathie know what activities Mike Porter had going on in his life? Could it be that they spent hours on the bashboard talking to each other? 5. Mike called Julie "dim." 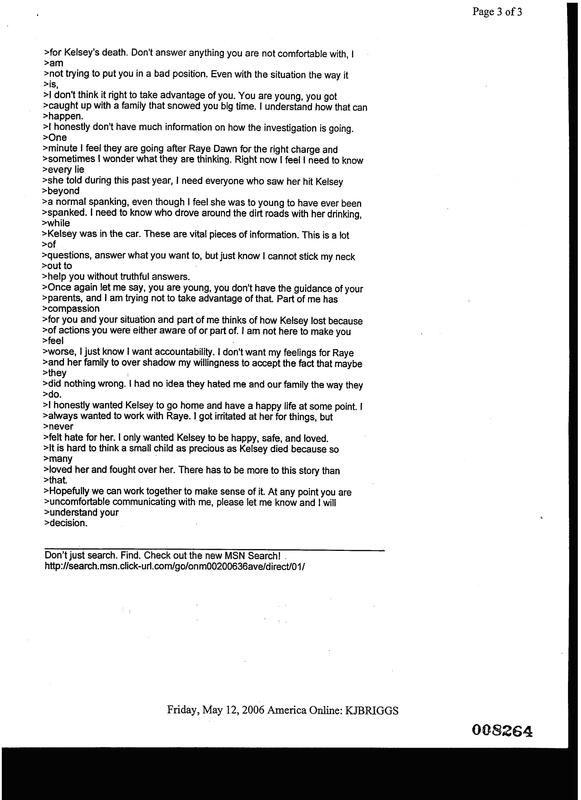 Julie was Kelsey's daycare owner and she is among several innocent parties that were drug into this by these two and their scheming. 6. "I can hand you your civil case on a silver platter." Music to Kathie's ears. 7. Of course he wanted her to help him! 8. Why is Mike's attorney's personal mission in life to disbar Greg Wilson? 9. He wants what Kathie wants. You've got that right! 10. Mike wants everyone to go down, and he's working his way into his plea. He doesn't want to face the death penalty, which is what he would have faced had he gone to trial.